A nourishing, filling and delicious soup of Bulgur, Oats, and Spinach. A filling soup without the calories, fats and meat. Loaded with heart healthy fiber. balls. 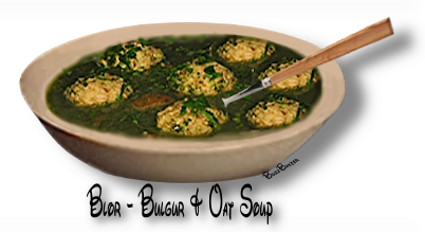 These balls are called blors and will be cooked in a broth. 1. Bring the broth to a boil and brown off the minced onions in a little olive oil. 2. Add the blors and all the other ingredients to the broth. 3. Season to taste with salt and pepper and boil for 8-10 minutes and serve hot.